Modern Old Testament interpretation arose in an intellectual environment marked by interest in specific historical contexts of the Bible, attention to its literary matters, and, most significantly, the suspension of belief. A vast array of scholars contributed to the large, developing complex of ideas and trends that now serves as the foundation of contemporary discussions on interpretation. 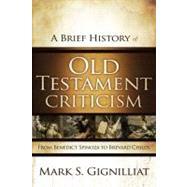 In A Brief History of Old Testament Criticism, Mark Gignilliat brings representative figures---such as Baruch Spinoza, W.M.L. de Wette, Julius Wellhausen, Hermann Gunkel, and others---and their theories together to serve as windows into the critical trends of Old Testament interpretation in the modern period. This concise overview is ideal for classroom use. It lays a foundation and provides a working knowledge of the major critical interpreters of the Old Testament, their approaches to the Bible, and the philosophical background of their positions. Each chapter concludes with a section For Further Reading, directing students to additional resources on specific theologians and theories. Mark Gignilliat (PhD, University of St. Andrews) is associate professor of divinity at Beeson Divinity School, Samford University, Birmingham, Alabama, where he teaches Old Testament. Gignilliat is the author of Paul and Isaiah's Servants and Karl Barth and the Fifth. Gospel as well as a variety of published articles. Gignilliat and his wife, Naomi, have two sons.